JASON Quit Bugging Me! Natural Insect Repellent offers you safe and effective insect protection for the whole family. This natural insect repellent is a safe, natural alternative to harsh chemical repellents. Stops bugs from biting, and provides fast, soothing relief from previous bites. Glycine Soja (Soyabean) Oil, Geranium Oil, Aqua (Water), Cocos Nucifera (Coconut Oil), Glycerin, Lecithin, Citric Acid, Sodium Bicarbonate, Benzoic Acid, Sodium Benozate. Shake well before use. Hold bottle 2-3 inches from skin and spray. Use just enough repellent to cover exposed skin. For best results, reapply every 2 hours. Children use adult supervision. Discontinue use if irritation or rash appears. Prolonged or frequent repeated skin contact may cause allergic reactions in some individuals. Do not apply to children`s hand. If accidental contact with mouth, eyes or children`s hands, wash immediately. 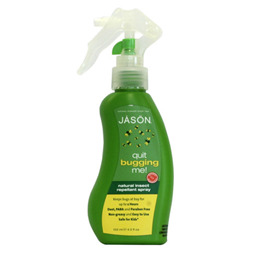 Below are reviews of Jason Quit Bugging Me - Insect Repellent Spray - 133ml by bodykind customers. If you have tried this product we'd love to hear what you think so please leave a review.